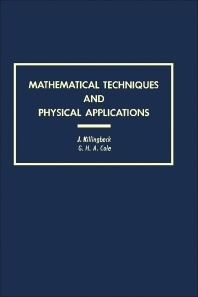 Mathematical Techniques and Physical Applications provides a wide range of basic mathematical concepts and methods, which are relevant to physical theory. This book is divided into 10 chapters that cover the different branches of traditional mathematics. This book deals first with the concept of vector, matrix, and tensor analysis. These topics are followed by discussions on several theories of series relevant to physics; the fundamentals of complex variables and analytic functions; variational calculus for presenting the basic laws of many branches of physics; and the applications of group representations. The final chapters explore some partial and integral equations and derivatives of physics, as well as the concept and application of probability theory. Physics teachers and students will greatly appreciate this book. B. Other Uses of Group Theory. A. Green's Functions as Kernels of Integral Equations; Boundary Conditions.